When we study history we like to use a spine, but we love adding as many real books in as we can. Although we haven't been studying American History this school year adding in an adventure with Daniel Boone has been a nice little break. 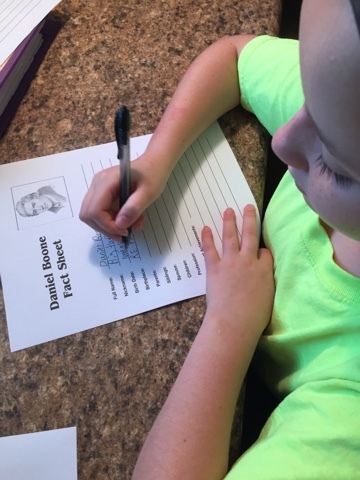 We just finished reading the Heroes of History biography Daniel Boone and using the Curriculum Guide for the book from YWAM Publishing. We love to read real books about history; biographies, historical fiction, etc. So when I look at WYAM Publishing all I can say is WOW!! I can drool over their selection of products all day. They offer 26 titles in the Heroes of History, 42 titles in the Christian Heroes, and 22 titles in their Heroes for Young Readers. Plus curriculum guides, audiobooks, fiction books, Spanish materials and so much more. The Heroes of History biography Daniel Boone is 215 pages long and was written by Janet & Geoff Benge. It starts out with five-year-old Daniel and ends with him being laid to rest with his wife, Rebecca. Daniel has a thirst for adventure even after trying to settle down. After falling in love and having children he still was not content with populated living. We get to experience Daniel's life as a boy, blazing new trails, being a politician and land owner, fighting, living and escaping from the Indians. The Curriculum Guide is a great companion to the Heroes of History series books. 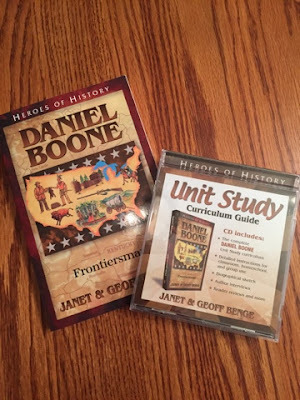 Once you access your guide you will have a screen that allows you to read about Daniel Boone, meet the authors, access bonus material and the unit study. The Unit Study covers History, Geography, Essay Writing, Creative Writing, Reading Comprehension, Public Speaking, Drama, and Art. Our unit study was divided into 2 sections. The first one contains eight chapters that include key quotes, writing assignment, hands-on activities, community resources, chapter questions, and more. The second section contains worksheets that include Daniel Boone fact sheet, maps, and a timeline. The bonus feature section includes games, puzzles, maps, extra information. This section is constantly changing. You can also meet the authors. This is a set of short videos about the books and the authors. Their Heroes of History books have been printed in nine language and there have been millions of copies printed. These video segments shows Warren Walsh from Emerald Books ask Janet & Geoff questions about their lives and writing the books. I read this book out loud to all three of my girls. We loved it! It was so nice to see so many different sides to Daniel Boone's life. Each night after reading the girls did not want to stop, they were enjoying hearing about all of his adventures. We also answered the questions out loud. This allowed us to get into more discussions about his life. I loved the maps that are included with the curriculum guide. I am from southern Indiana, so my girls have been to Kentucky and other eastern states several times, but the maps really help them see exactly where Daniel explored. The curriculum guide has a wide enough range of activities that it can be used with children of all ages and learning styles. We found the Meet the Author section very informative. Delaney loves to write and has written several short stories so this is a great resource for her to be able to hear from published authors. It was very interesting to find out how many books Janet & Geoff read while doing research for their own books and how they visit places their characters lived. I loved that Janet said she actually feels she knows the people they research and their families. We enjoyed the Heroes of History so much we will be reading more in the future. The book along with he curriculum guide offers a nice break from our regular school work or the books are great to read on their own.